This month there were several more pet food recalls announced which should be a concern to all pet owners. Because pets are family, we endeavor to feed them food we feel is safe and wholesome. We realize pet owners can be overwhelmed with the vast number of pet food choices on the market today besides what foods we can recommend as your veterinarian. One trip to the grocery store or pet store can make one’s head spin trying to decipher the age appropriateness of the food and ingredients – while choosing between dry, wet, raw, organic, all natural, grain free – and finally weighing it all against cost! Then there is the vast array of treats to choose from! While it’s nearly impossible to ensure that your pet will never come in contact with tainted food or treats, you can reduce the risk by being proactive and discussing food choices and nutritional needs with your veterinarian. We are giving you a few pet food recall resources below. We encourage you to follow these recall sites in order to stay abreast of the pet food recalls as they occur so that you can react quickly if necessary. FDA – US Food & Drug Administration / Pet Food Recalls – On this site you can also learn how to report a pet food complaint. Consumer Affairs Pet Food Recalls – This site provides notices on current pet food recalls as well as news regarding legalities as a result of the recall. Salmonella seems to have become quite common on pet food recall lists the past few years. It’s also a concern if you are feeding raw pet food to your pets. More than contaminated pet foods can expose dogs and cats to Salmonella. Other animals shedding Salmonella in their feces can put your pet at risk, or they can also get the disease from contaminated human foods we give our pets, such as raw meats and eggs. It’s important to read the recall notes thoroughly and follow the instructions on the notice. The FDA notices are especially noteworthy, as in this recent case of recall of Rawhide Chew Products (https://www.fda.gov/Safety/Recalls/ucm563544.htm) because they will explain the risks to the pet and human, and what symptoms of illness to look for. In any case, contact your veterinarian if you discover you have fed your pet a product that has been recalled for whatever reason, even if your pet isn’t showing any symptoms of illness. Let your veterinarian help determine the best course of action and start a treatment plan if necessary. 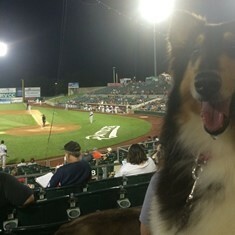 Join Us at the July Somerset Patriots Bark in the Park Night! We’re excited to announce Belle Mead Animal Hospital will once again participate in the Somerset Patriots Bark in the Park Night on Wednesday, July 26, 2017. Bring your leashed dog, family, and friends for a fun evening at TD Bank Ballpark in Bridgewater. Stop by our table in the concourse to meet our Belle Mead Animal Hospital team and find out what surprises we have in store for you that night! 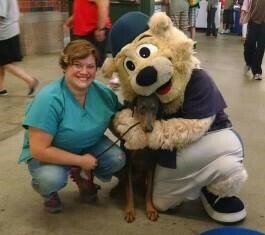 Read about some of our activities last year: Another busy Bark in the Park Night! It’s always a great night out, so hope to see you there!